Yes am very happy with your service. Since Mitch added on the 17th of September my finances are just hard now that I don't have his income. Thank you so much for the excellent customer service! My expectations were definitely exceeded in every aspect. I use Active to service my rental property and for all my clients for my home inspection company. They are the best! Always professional and quality service. I would recommend them to anyone! 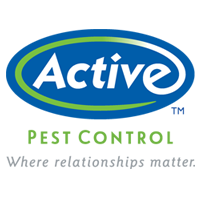 I was not very happy with my first service with Active Pest Control... the guy who came out to not explain anything to me it was not very thorough. BUT this past time a technician named Chad came out and he was absolutely amazing. He did a very thorough application and explanation of everything. He even took the time to tell me ways to better seal off my home, like using weather stripping and Spray Foam. I have a newborn baby and he was very considerate of that as well and he also had questions about my animals. Since his visit I have not seen any Critters inside my home. He was a prime example of good customer service and he's the only reason I will stay with Active Pest Control. The staff of Active are always so polite and helpful. They take the time to answer questions. We are very happy with the level of service we receive. Our technician, Justin was very friendly, knowledgeable, and answered all of my (many) questions! He did not seem bothered by them at all. We recently moved here and this was our first encounter with Active pest control. The office staff (especially Amber) was kind and helpful in setting up our account. Highly recommended. The technician was very professional . He took time to answer questions we had concerning the chemicals used and how it would affect pets. I will recommend Active Pest Control to my neighbors. The techs have been punctual / professional / knowledgeable / and answer all of our questions. I highly recommend Active Pest Control. They did an amazing job of quick fast and friendly service. My technician was very nice and respectable! He even offered to take his shoes off! Thanks for coming out and making this an easy solution to our pest problems. extremely pleased with your service. Thank you for the professional service and care you provided. Excellent service,took care of our problem. Our service technician was very informative, although didn't offer a military discount the technician was knowledgeable. Excellent customer service every time I call in very nice gentleman when he comes out to spray the house each and every time. Our tech was super friendly and the scheduling process was easy! Active was highly recommended by a friend and we are pleased with their service. Courteous and on-time service staff do a great job of keeping the pests controlled. We definitely recommend this service. Active always gives us a heads up for when they will be coming out. Even though the work is out side, he always lets us know he is there. Each time work is completed as expected. I have been pleased with my service from the very first day the pleasant attitude and introduction i recieve when the person came namely Steve and i would recommend u highly to anyone else,love the service. The field personnel were very personable and professional. Answered questions readily and were very interested in providing the fix to our termite problem. It feels good knowing the people will take care of concerns. I am very happy with my service. A great, professional and affordable pest control for anyone home. thanks. I love the service provided, Justin is very thorough and helpful, he always makes sure that I an satisfied. I haven't seen any insects lately. I think we made the best choice for our Pest control. Thanks. I experience a termite problem. The problem was immediately addressed and repairs were made in an excellent and professional manner. I felt my home was made safe again. Friendly service.Quality service.meets my needs.no problems. Great technician. Professional and kind,took time to do his work the right way and I felt he was super thorough. Had an issue with the appt early on and when I called about it..the call center was more concerned about enforcing policies than making a customer relationship and her supervisor listened and understand where I was coming from..made my experience much better as a first time customer so much that I bought again for my mom and will continue services with you. Very professional and on time. Wonderful job!! We were told that the tech would meet us at a specific time and he was there on time. Everything about the experience was awesome. Will def use Active again! Very professional and helpful! Thank you Active Pest Control for getting rid of the pesky black ants! Horrible experience, bait and switch. I paid 92.00 on Groupon for termite service that was supposed to have a value of $585. The sales person came to my home and said I would have to pay an additional 150.00 because I have a porch. I have had termite service before with another company and I was charged under 100.00 for application. I already have holes drilled in the concrete porch floor. The sales person said he would still have to charge the additional $150 to drill holes even though the holes already exist. This was clearly deceitful. A Service technician would use the existing holes and I would be paying $150 up charge for nothing-bait and switch. I own other rental properties and I know other real estate investors and I would have a hard time recommending your service at this time based on this experience. Good service; would have liked more communication in process; they called two weeks after I thought they were done and said they would finish the job. It was my lake house and fortunately had my closing delayed twice. I didn't feel like I would necessarily tell a friend..i felt like I told the tech what problems I was having and he didn't even say yes I found the entry point of the ants entering into the home. I fixed this issue or you may need to cover this opening up.. I got nothing but maybe it's a training opportunity or just something that you don't offer as a company as a follow up.